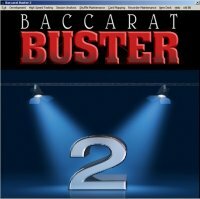 Baccarat Buster may be available from the Blackjack Review Network catalog. Check for availability. 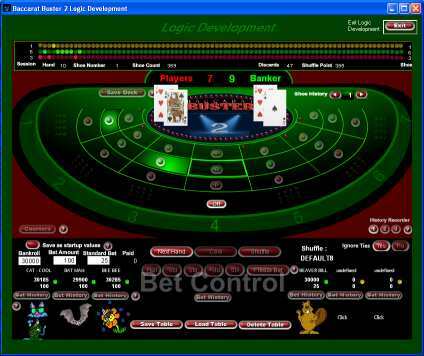 Baccarat Buster is Windows based software. Baccarat Buster is not a game or toy, it was designed for the advanced Baccarat player as a set of professional tools. It is the only serious Baccarat software on the market today. First, it was originally developed atop a shuffle engine, the same shuffle engine that’s been driving Mesa Verde’s Shuffle Trak software since 1991. That means that you are practicing and testing against a real shuffle, not a random number generator. That means that you get an endless series of non-repeating shoes. These are actual playing conditions, not simulated. 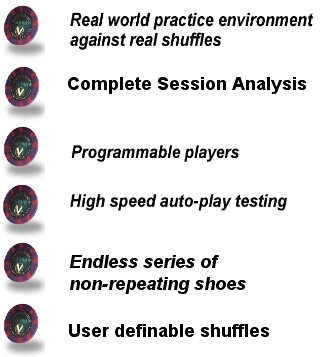 You can even define your favorite casino’s shuffle and practice against that casino. If you are looking for a real world testing environment, this is the software that gets the job done. No excuses here, if you can’t beat the game here, you can’t do it at the tables. There are no other factors that influence the outcome. Table graphics are outstanding, you are seated at the end where you can play any of the positions 1 to 7. You can designate a position to be empty, you can play any position or you can assign it to the computer to play. When the computer is playing a position, it will place bets based on your programmable logic. You can program a variety of different logics including pattern recognition and bet progression. Most players come already pre-programmed, watch players 5 and 6, they win consistently. Card graphics are superior, cards are dealt from a shoe at the top of the screen, they move to their position where they are exposed. You can turn off the moving card graphics by selecting High Speed play mode. When in High Speed play mode the cards just appear at their positions and the game moves much faster. While you have the High Speed Mode enabled, you can enter a number in the “Number of Shoes to Run” window and Baccarat Buster will go through that many shoes without stopping. This is a good way to test player logic, you can see real fast if your logic is going hold up in the long run. And all the time, the system is recording every aspect of the play, what bets you make, what bets all the other players make, the outcome of every hand etc. After your session, you can go to the Analysis section where you can review and critique every play. You can print a complete Score Sheet for yourself or any of the computer players. The score sheet will show each of the hands, your bet, the winner (in Z columns), your running total and a Win/Loss pattern column. You may also print blank score sheets. In the Analysis section, the system will do a complete pattern recognition analysis and print the results showing how many times each pattern was found and the percentage, how many times Bank won on the next hand and percentage, how many times Player won on the next hand and percentage, how many time Tie was the next winner and percentage. It will also do a Losing Streak analysis, showing the longest and average number of times until Bank, Player or Tie came up as the next win. It will also give you a chart showing the 8 top percentage patterns. Then you can go to the Plotter Screen where you can enter patterns and the system will graphically display every spot in every shoe where that pattern occurred. And finally, if you are interested, there is a comprehensive Shuffle Analysis section that will completely dissect a shuffle and graphically display where every cards goes.